“The No Tillegra Dam Group (NTDG) was presented with the Nature Conservation Council’s (NCC) Most Outstanding Environment Group award at the NCC Annual Conference on Saturday 29th October 2011. 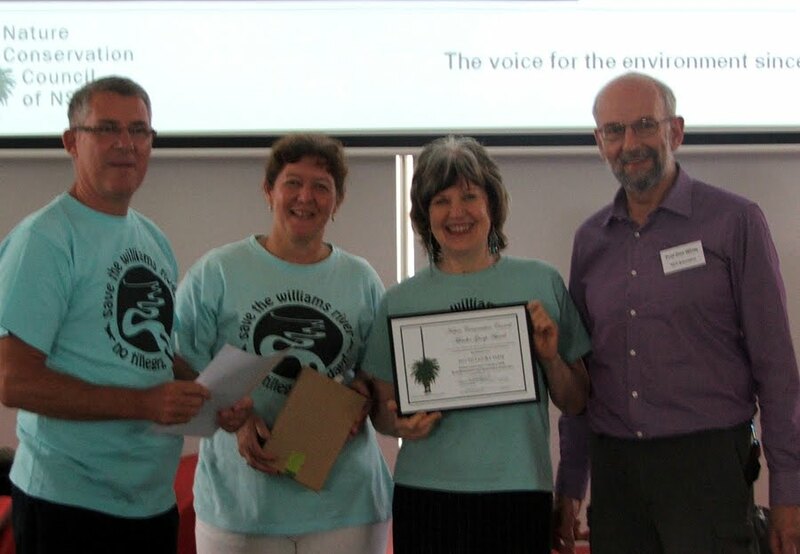 The award is presented annually to a Member Group of NCC which has demonstrated outstanding commitment and success in the conservation of the NSW Environment. Carol Pasenow Chair NTDG, said it was a delight to accept this award on behalf of the members of NTDG. For a small grass roots community group to achieve the outcome which we did is testimony to the hard work and determination shown by our group. The historic decision around the Tillegra Dam proposal and the determination that NO dam shall be built in the Hunter is evidence of the detrimental effects a dam would have on not just the Williams River but the whole of the Hunter’s river network. This award should also be shared with member groups of the Save the Williams River Coalition; The Wilderness Society, Hunter Environment Centre, Total Environment Centre, and National Parks Association, as well as Dr John Kaye, and the Greens, who contributed enormously to our campaign. We must also thank the Hunter community whose environmental awareness and support was paramount to our campaign. Ms Pasenow says “NTDG is now addressing the future of the Dungog community which has suffered through four years of indecision. We welcome the O’Farrell government’s commitment of no dam in the Tillegra valley and no desalination plant for the Hunter. NTDG requests that the Premier now follow through and direct the Department of Planning to commence a ‘Whole of Government’ strategy to sell all Hunter Water owned land in the Williams River Valley. By instigating a proper land use plan we can promote a sound socio-economic future for our community. A future that ensures the preservation of the natural beauty, rural aspect, the social and natural heritage of the valley and it’s unique environment. NTDG will work towards promoting sustainable water planning which encourages community and independent consultation. Warwick Thomas, Carol Pasenow and Sally Corbett, Don White NCC Chairperson.